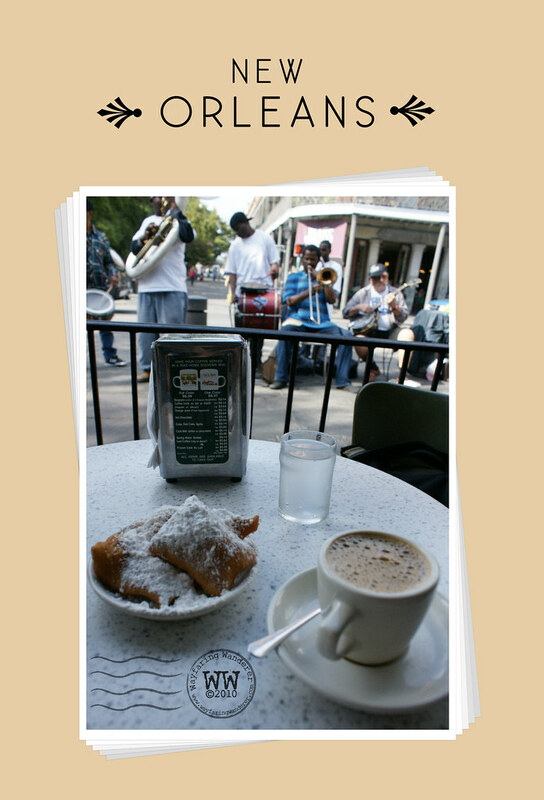 Wayfaring Wanderer: Postcard from New Orleans | Ending a Sugar Strike in Style! Postcard from New Orleans | Ending a Sugar Strike in Style! My one and only wish for the first day of exploring was to end a five week long sugar strike in style by eating a plate full of deep-fried dough doused in powdered sugar, otherwise known as beignets. Mission accomplished! We went in with the intention of sharing a plate of 3, however, after plowing through our first few we decided that it was imperative to order yet another plate. The excitement of eating sugar for the first time in five weeks was almost as exciting as the band playing on the sidewalk just outside the cafe. A front row seat was waiting for us when we got there so we could see all of the action. Afterward, we set out to explore more of Decatur St. by foot. It's hard to believe that I spent a total of five hours touring the city – well, a portion of the city -- and only saw a very small fraction of what this place is really made of. To give you a better idea of how little ground we actually covered, we didn't even walk the entire length of that one road. Luckily, I have plenty of time to see even more while I'm here, which I definitely intend on doing! pass that plate! or order me 2!!!! GAH! beignets in nola, nothing better.